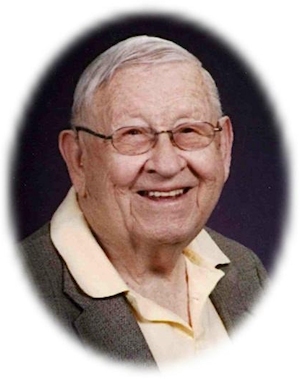 Obituary – Yahn, Glenn August « Perry High School Alumni Association, Inc.
﻿Vice-president, Orchestra, Honorary Society, Hi-Y, Glee Club, Debate, Operetta, Citizenship. Glenn Yahn, 97, of Perry, Oklahoma, was the son of Fred and Estella Yahn. He was born April 26, 1910 in Perry, Oklahoma and died Sunday, July 29, 2007 at his home. 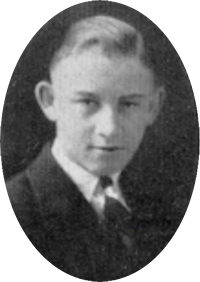 Glenn graduated from Perry High School in 1928 and was valedictorian of his senior class. He graduated from Oklahoma A&M in 1932. He began working for Donaldson and Yahn Lumber Company in 1932, became a co-owner and then president and CEO in 1966, working in the business until retiring in 1993. He married his college sweetheart, Eleanor Thornton, on December 20, 1936 in Pawnee, Oklahoma. They were married 65 years. During World War II, Glenn served his country with the United States Army and Air Corps in the Philippines. He was a member of the Veterans of Foreign Wars and American Legion for 55 years. Glenn served as president of the Oklahoma Lumberman’s Association and the OSU Alumni Association and was a past president of the Perry Rotary Club. He had served as a board member of the Mid America Lumber Association, the State Board of Education and the State Board of Vocational and Technical Education. Glenn was a member of Pi Gamma Mu and Phi Kappa Phi and served as president of the Beta Theta Pi social fraternity. Glenn, a 74-year member of the Perry Chamber of Commerce, served several terms on the Chamber board of directors and served as vice president of that organization. An elder of the First Christian Church for 55 years, he also had served as chairman of the official board and been a member of the church board of trustees. He was a past director and president of the Cherokee Strip Historical Society, was a member of the OSU Posse Club for many years and was a lifetime member of the OSU Alumni Association. Glenn was the recipient of an OSU Service Award, was named Chamber of Commerce Citizen of the Year in 2005 and was named a Distinguished Perry High School Alumnus in 2006. Memorial services will be at 11:00 a.m. Thursday, August 2, 2007 at the First Christian Church in Perry. Rev. Martin Foster will officiate. Services are under the direction of Brown-Dugger Funeral Home. Memorials may be made to the First Christian Church, Companion Hospice or Fellowship of Christian Athletes in care of Brown-Dugger Funeral Home, 1010 N. 7th Street, Perry, Oklahoma 73077. Glenn is survived by one daughter, Bettye Kaye Evans and her husband Gary of Muskogee, Oklahoma; two granddaughters, Jennifer Moore and her husband Lake of Muskogee, Oklahoma, and Jill Blake and her husband Ryan of Stillwater, Oklahoma; two grandsons, Jake Evans of Muskogee, Oklahoma and Grant Evans of Irving, Texas; five great-grandchildren, Arden Moore, Lake Moore, John Blake, Mia Blake, and Joe Blake; and two nieces, Glenna Lee Burns and her husband George, and Nancy Durffee and her husband Ed. In addition to his wife, Eleanor, Glenn was preceded in death by his parents, 1 brother and 2 sisters.